White Kidney Bean extract is an all-natural supplement made from 1000mg White Kidney Bean Extract, standardized phaseolus vulgaris, that may help reduce digestible carbs in starch-rich foods. 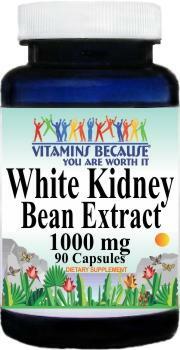 White Kidney Bean extract is a carbohydrate blocker that works by inhibiting the digestion of starches. By inhibiting their digestion, starches that are eaten are either left undigested in the gut or the amount of which is digested is reduced. These starches are either excreted and their calories not absorbed, or they are given to colonic bacteria to ferment (eat). When given to people who are not otherwise on a diet (during their highest carb containing meal), white kidney bean extract is able to reduce body weight and body fat levels similar to simple caloric restriction. In cases of overfeeding, white kidney bean extract can alleviate the expected increase of body fat gain and blood parameters like triglycerides and blood glucose over time. It is also possible that white kidney bean extract can protect against colon cancer in the same manner as soluble fiber.